Are ye runnin' a bit low on loot? Here's a chance to win 5,000 crowns! All you have to do is compose a piratey poem. It can be as long or short as you want, and it doesn't necessarily have to be about Pirate101, but it does need to be pirate themed. At the end of the contest, I will read all the entries and choose the one I think is best. That person will win a code for 5,000 crowns! Sound good? Here are more details! 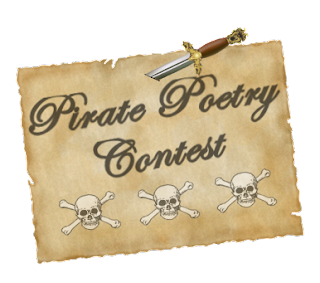 Compose a pirate themed poem. All entries must be your own original work! Please keep the poem family friendly! The winning entry will be posted on the blog. If you are under the age of 13, please get permission before entering! May we submit more than one entry?